Right now, I'm in the City of Lights with a friend! We just arrived yesterday! I wasn't planning to do any blogging here but this City is just so inspiring, I couldn't help but write about it 'tout de suite'. Paris had always been on my mind. Judging from the Dorling Kindersley Eyewitness Travel Book that I got (years ago!) in preparation for this trip, I told myself that I'd probably fall in love with every corner of the city. And it started coming true! 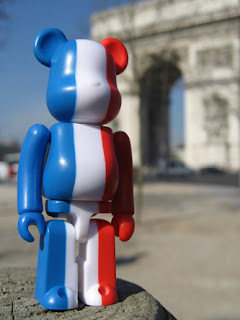 Above left is my France Be@rbrick, from Series 12, standing on a cement stump in front of the Arc De Triomphe. It falls under the 'Flag' Category in Be@rbrick design. 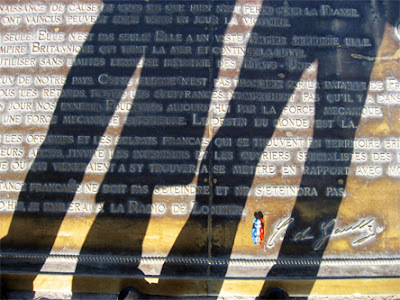 Directly above is a picture of my friend and I looking at Charles de Gaulle's speech, Appeal of 18 June 1940, cast in bronze on the floor of the famous arch. This was a celebrated speech by Charles de Gaulle, the leader of the Free French Forces, during World War II. Standing there, amidst the throngs of people lining up to read it, I somehow sensed the greatness of those words, even if I didn't speak the language. I honored the moment by placing my French Flag Be@rbrick right next to CDG's signature. What an occasion! First time I visit your blog, which is great; while u visit my city, amazing! Désolé, un problème technique est survenu. Nos ingénieurs ont été avertis et vont s'en occuper.